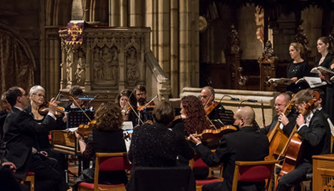 Featuring some of the best period instrument specialists in the UK, the goal of The Hanover Band is to give audiences a feeling for what earlier music actually sounded like when heard in favourable circumstances. With their gutsy playing ‘stripping decades of varnish from the score,’ as the Times says, Handel’s ever-popular Messiah will sound fresh and new. George Frederic Handel composed Messiah in just 24 days, a wonderful achievement, completing it on September 14th 1741. Although Handel borrowed some music from earlier compositions, there is no sense of disorganised structure. Indeed this is a carefully crafted masterpiece, showing inspired architectural design, taking us from the first sombre chords to the triumphant final chorus. The text, organised and sent to him, by Charles Jennens, gave Handel inspiration for some of this most enduring music. In three parts, dealing with prophecies of the coming of Christ and His birth in Part 1, His death in Part II, and the Kingdom of Heaven in Part III. The final movement in part II, the Hallelujah Chorus, with its three simply stated lines of text between the exclamation of ‘Hallelujah!’ has been called the most well-known single item of classical music. When King George II stood during the singing of the Hallelujah Chorus, he started a tradition that is still continued today.